A new variety which, in Europe has provided the heaviest yield of all Whitecurrants, exceeding even that of the standard variety White Versailles, yields of Blanca usually top 4kg per square metre in commercial trials. The long trusses of pearly white, large and evenly sized berries and increased cropping potential mean that Blanca will almost certainly become the foremost Whitecurrant variety in the UK. It is also later in Season and therefore useful grown in combination with other varieties as a season extender. 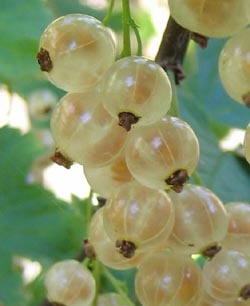 Whitecurrants are becoming increasingly popular, they make a delicious soft pink coloured jelly, and, being sweeter than other currants may also be enjoyed straight from the bush!